The sitter's granddaughter, Maria T. Moore [1816-1906], New York, and Stamford, Connecticut; her nephew, the Reverend Francis Van Rensselaer Moore [1872-1949], Vineland, New Jersey. (André E. Rueff and Mary H. Sully, New York); sold 31 March 1921 to Thomas B. Clarke [1848-1931], New York; his estate; sold as part of the Clarke collection on 29 January 1936, through (M. Knoedler & Co., New York), to The A.W. Mellon Educational and Charitable Trust, Pittsburgh; gift 1954 to NGA. 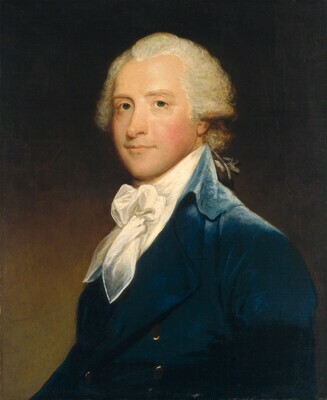 Miss Moore's will (copy, Clarke files, National Gallery of Art) directed that her nephews draw lots for the portrait. The lottery was won by the Reverend Moore. He stated in an affidavit dated 8 April 1921, at the time of the sale of the portrait to Clarke (NGA curatorial file), that it had been given by Constable to his daughter Emily [Mrs. Samuel Moore, 1795/1796-1844], and by her to her daughter, Miss Moore, but this has not been confirmed. The name of the seller and the date of purchase are recorded in a copy of Portraits by Early American Painters of the Seventeenth, Eighteenth and Nineteenth Centuries Collected by Thomas B. Clarke (Exh. cat., Philadelphia Museum of Art, 1928) annotated with information from files of M. Knoedler & Co., NY (copy in NGA curatorial records and in NGA library). André Rueff sold several other American portraits to Clarke, including NGA 1947.17.25, 1947.17.65, and 1947.17.107. Mary Sully, who worked with Rueff on some of these sales, arranged Clarke's purchase of Stuart's portraits of the Thorntons (NGA 1942.8.25 and 1942.8.26). Portraits Painted in the United States by Early American Artists, The Union League Club, New York, February 1922, no. 5. Portraits by Early American Artists of the Seventeenth, Eighteenth and Nineteenth Centuries, Collected by Thomas B. Clarke, Philadelphia Museum of Art, 1928-1931, unnumbered and unpaginated catalogue, as by Gilbert Stuart. Loan for display with permanent collection, Boyhood Home of Robert E. Lee, Alexandria, Virginia, 1968-1986. Extended loan for use by Justice David Souter, The Supreme Court of the United States, Washington, D.C., 1991-2009. "Current Comment: Exhibitions." Art in America 10, no. 3 (April 1922): 144. Park 1926, 232-233, no. 180. Portraits by Early American Artists of the Seventeenth, Eighteenth and Nineteenth Centuries, Collected by Thomas B. Clarke. Exh. cat. Philadelphia Museum of Art, 1928, unnumbered, as by Gilbert Stuart. Sawitzky, William. "Some Unrecorded Portraits by Gilbert Stuart, Part Three." Art in America 21, no. 3 (June 1933): 84, 90-91. American Paintings and Sculpture: An Illustrated Catalogue. National Gallery of Art, Washington, 1970: 108, repro. American Paintings: An Illustrated Catalogue. National Gallery of Art, Washington, 1980: 239, repro. American Paintings: An Illustrated Catalogue. National Gallery of Art, Washington, 1992: 358, repro. Miles, Ellen G. American Paintings of the Eighteenth Century. The Collections of the National Gallery of Art Systematic Catalogue. Washington, D.C., 1995: 287-289, repro. 288.